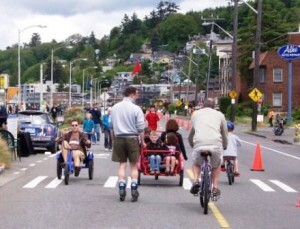 Open Streets: Coming to a community near you? Imagine a street closed to motorized traffic. Now imagine this street alive with human activity and energy—people of all ages dancing, biking, walking and playing in the street. Welcome to ciclovia! Ciclovias, or open streets, temporarily transform that public space—a roadway—into a public place for residents to bike, walk, socialize with friends, play games and celebrate their community. An open streets event is not a block party or a street fair. It’s an opportunity to engage community members in physical activity, allows them to imagine living somewhere that can be easily biked or walked, and gives them a new perspective on how we might use our urban public space. 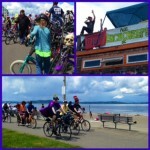 Seattle’s Bicycle Sunday, introduced in 1965, is the oldest continuous open street initiative in North America. A three-mile stretch of Lake Washington Boulevard between Seward Park and Mount Baker Beach is closed to vehicles on scheduled Sundays from May to September. Children learn to ride their bikes at Bicycle Sunday. Residents stroll and jog along the car-free route. Seattle holds another open streets event called Summer Streets. Now in its fifth year, Summer Streets temporarily closes streets in various parts of the city throughout the summer. Volunteers organize games and activities to encourage residents to celebrate and enjoy their neighborhoods in a different way. Spokane’s Summer Parkways started in 2010 and is organized by the nonprofit Spokefest. This year’s ciclovia-inspired event will close a four-mile loop in the Comstock-Manito neighborhood to motorized traffic and opens it up to all kinds of creative human-powered activities. The Five Mile Drive loop in Tacoma’s Point Defiance Park is closed to motor vehicles until 1pm every Saturday and Sunday. 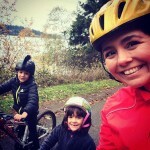 This weekend closure offers residents a great place for family bike rides. Bicyclists and pedestrians can peacefully wind their way through an old growth forest as they take in scenic sound and mountain views. New in 2013 is Vancouver’s Sunday Streets Alive. Five major activity centers will be located along the 4.2 mile route, offering a range of fun activities to keep the body and brain moving. Organizers anticipate 3000-8000 residents will participate in this inaugural open streets event in southwest Washington. Would you like to bring a ciclovia or open streets initiative to your community? The Open Streets Project offers resources and technical assistance that can guide city agencies and nonprofit organizations in developing an event for the community. This article was posted in Attitudes, Encouragement, Events, Health, Seattle, Spokane County, Sustainable Living, Tacoma, Vancouver and tagged open streets. Bookmark the permalink. Follow comments with the RSS feed for this post. Both comments and trackbacks are closed.